After Russia I headed to the warmer climes of the Middle East. 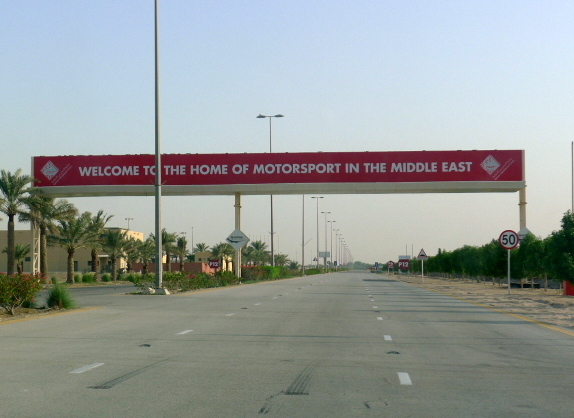 My first stop was Bahrain, most famous for it’s hosting of the Formula 1. A small island country with a population of about 1.2m, Bahrain is nestled between Saudi Arabia and Qatar in the Persian Gulf. Few Westerners head to Bahrain as a tourist stop – when they think Middle East, they think Dubai. But Bahrain shouldn’t necessarily be overlooked when on a tour of the Middle East for it is not without its charms. The country is easy to navigate and taxis are affordable. The architecture is modern, and sights include the likes of the ancient Bahrain Fort that dates back 5,000 years and Manama Souq. Attitudes are very liberal for a Middle Eastern country and prices are somewhat cheaper than Dubai. 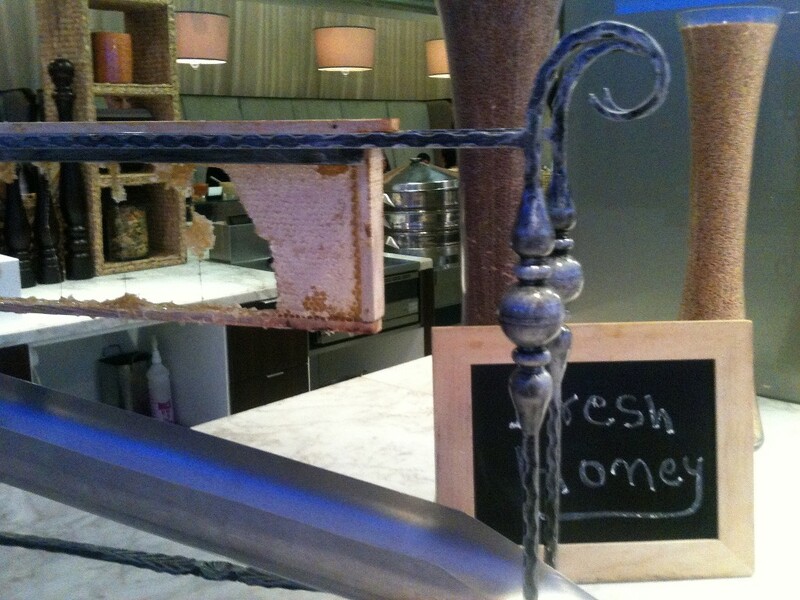 In Bahrain I stayed at the Kempinski Grand & Ixir Hotel. It is linked with the City Centre Shopping Mall, the largest mall in Bahrain with hundreds of of outlets. It is also home to Wahoo, the Middle East’s first ever indoor-outdoor waterpark. Covering an area of 15,000 square-metres you can be assured of a plentiful number of fun rides and water slides. The Kempinski is a city hotel with two buildings, the Grand and the Ixir which are each individually decorated in modern European and traditional Arabic styles. The hotel only opened about two years ago so the finishings are dazzlingly new. The hotel houses five restaurants, a bar and a nightclub, and facilities include a well-kitted fitness centre, an outdoor pool and a luxury spa. 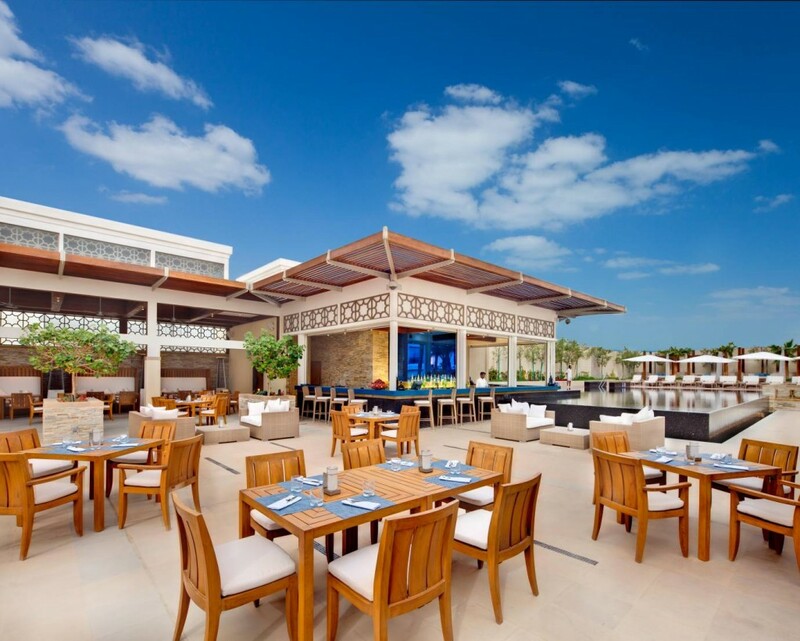 Nestled alongside the pool is Nasmat, a restaurant that serves Mediterranean cuisine. There is also a bar that offers an opportunity to tuck into some refreshing cocktails while you chill out in the hotel’s infinity pool. As for the spa, apart from the usual wellness and beauty treatments it also offers a Turkish Hamman. I popped into the spa to try a 45 minute hamman (BD35 – about £57) and it was truly luxurious. The session begins with a full-body scrub after which you are then draped in a senuous body foam and given a massage. 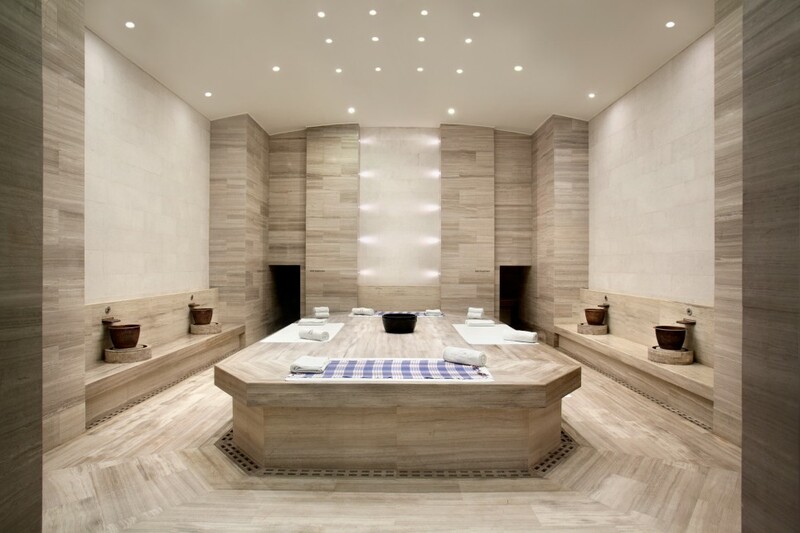 The experience was traditional in the sense that it followed the age-old Turkish rituals, but unlike the ancient hammans of Turkey, the hamman at the Kempinski was state-of-the art and the therapist was charmingly professional to complete a truly unique experience. My room was comfortable and warmly decorated, with the funkiest aspect being the supremely modern bathroom. Encased by a clear glass panel such that you could sink in the stylish bathtub and still be able to watch TV, the glass panel could also be adjusted for full privacy at the touch of a switch. Very cool. 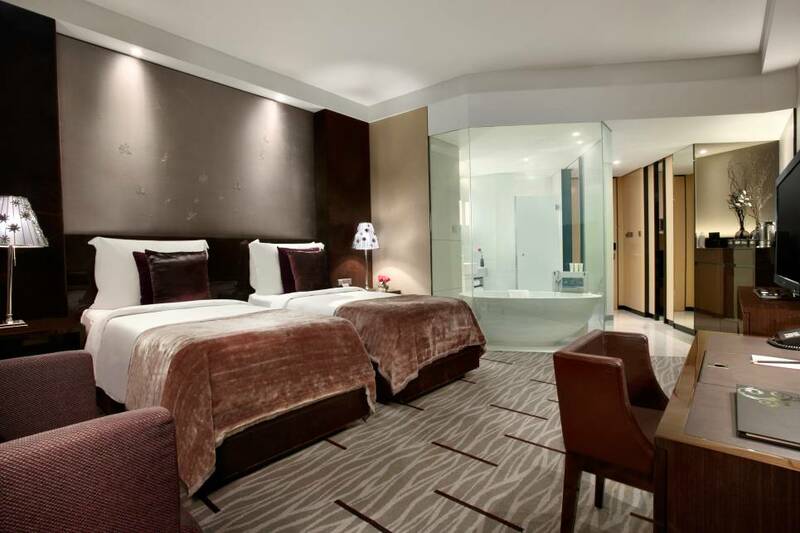 The beds were great with the finest crisp-white Egyptian cotton sheets for a good night’s sleep. 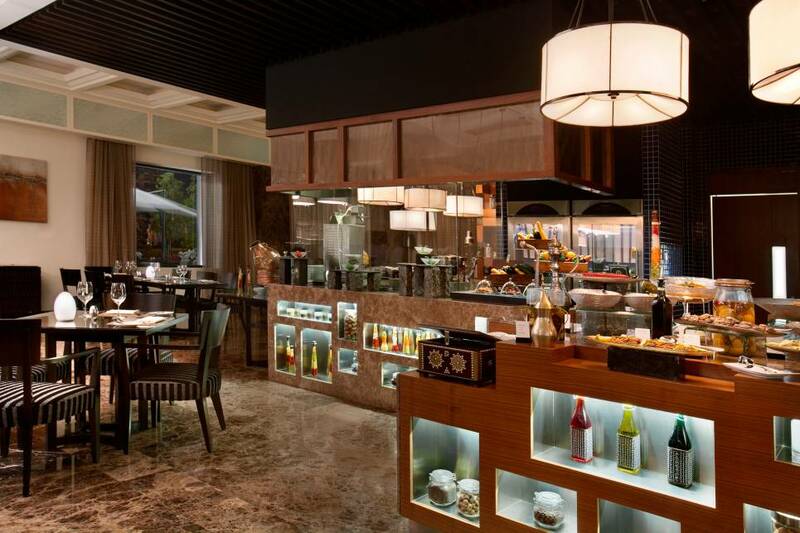 As mentioned The Kempinski has five restaurants, and Saveur Restaurant was where the busy breakfast buffet was held. It offered a generous array of goodies and of note was the delicious fresh honeycomb, a nice touch compared to the usual range of jams and other spreads at most hotels. Lunch at Saveur was also a buffet, but dinner at Saveur Restaurant was an à la carte service that proved to be a quieter affair. 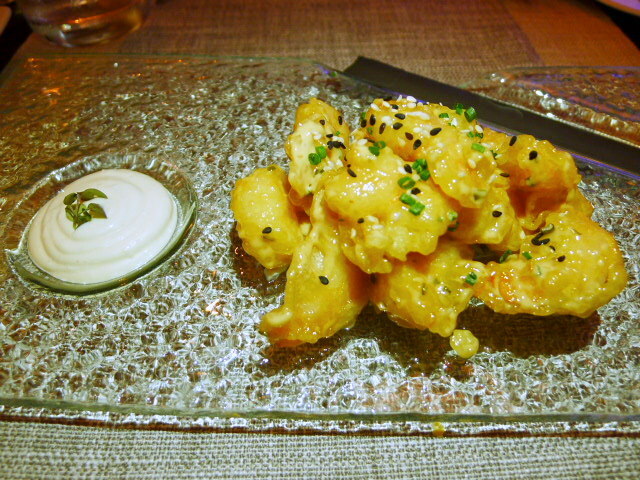 To start was an excellent Asian themed rock shrimp tempura with a miso dip and a daikon soy sauce (BD6.000 – about £9.80). The shrimps were firm and tasty, and the batter, although not a traditional tempura batter, was super crunchy and well made. The daikon soy sauce coating made for a great combination and the dip was excellent. 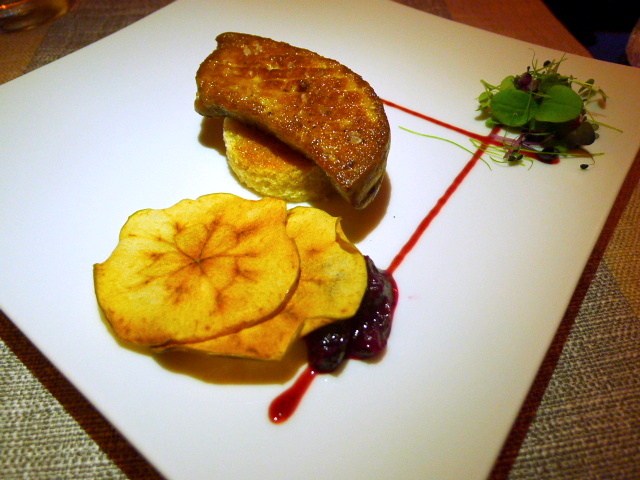 Next a pan-seared foie gras with brioche, dried apple, wild berry chutney (BD7.500 – about £12.20) was nicely done. The foie gras was rich and flavoursome and there was a nice balance of acidity in the dish. However the side salad wasn’t, but should have been dressed. Lobster bisque with diced fresh Atlantic lobster and herb oil (BD6.500 – about £10.60) was creamy with a delicate lobster flavour. It was a yummy soup, but with a slightly more intense concentration of lobster flavour it would have been perfect. A main of pan-fried hammour (BD10.000 – about £16.30), a popular Middle-Eastern fish, was beautifully fresh, well cooked and moist, although a crispier skin would have worked better. An interesting sauerkraut accompaniment really worked with the fish as it gave it a lovely acidity. 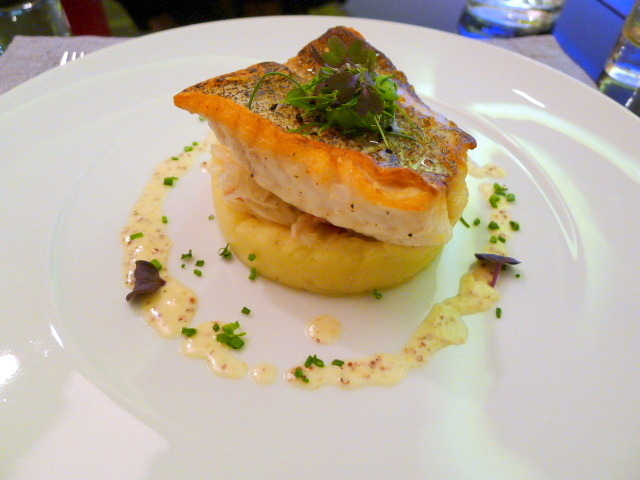 Rounding of the dish was a delicious, buttery potato purée and a creamy mustard chive sauce. Desserts were for the most part very, very good and consisted of a daily unlimited buffet selection of assorted treats (BD4.500 – £7.30) , perfect for those who love to hoover up lots of sweets. The Western desserts were surprisingly the best of the lot, surpassing the baklavas in superiority. 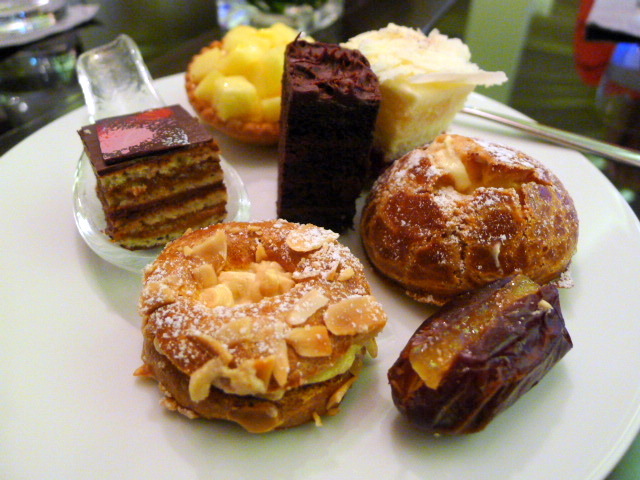 The chocolate cake was rich and moist, the crème caramel was fantastic and the opera cake was superb, although the desserts with choux pastry were a little dry. Not to be missed was the um ali, a traditional Arabic dessert made with puff pastry and baked with milk and cream that was absolutely heavenly. The Saveur Restaurant menu was predominantly European in style, but for a touch of Arabia there was also Baharat restaurant. Their signature dish was a slow braised lamb shoulder marinated with homemade ‘Baharat’ spices (BD14 – about £23) for two. 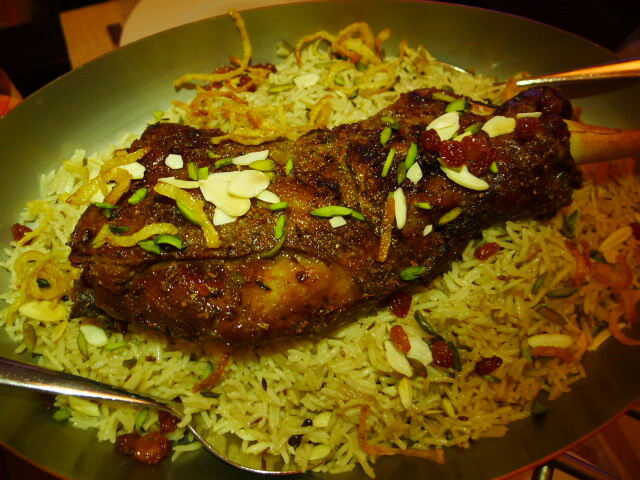 Served with cumin sauce and clove rice, it was supremely appetising with its tender, moist lamb and delicate balance of spices. 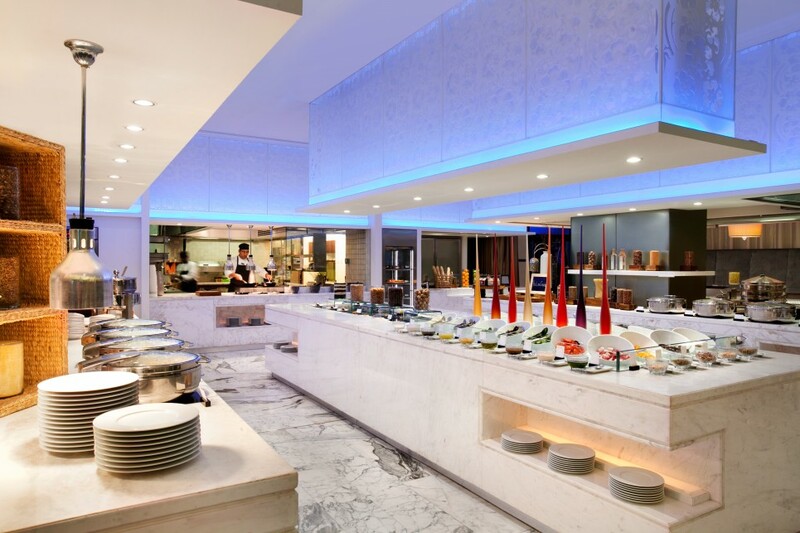 The Kempinski Grand & Ixir Hotel, Bahrain was centrally located for all of the city’s major attractions and offered an abundance of solid, dependable and tasty food as well as a top-notch hamman experience. The hotel does not have access to the beach but the lovely pool area more than did the trick. And Bahrain was a pretty pleasant place to visit. It’s more demure than Dubai, but it easily made for a chilled out three-day break. Prices: BD10 to BD40 (about £16 to £65). Excludes tax, drinks and service. Tip for the traveller: Bahrain is a one-hour hop from Dubai. If searching for flights to and from Dubai, try Air Arabia which flies in and out of Sharjah Airport rather than Dubai International Airport. My one-way flight from Bahrain to Dubai on Air Arabia was about half the price of that on Emirates (about £50 cheaper). Sharjah is about 15km from Dubai, and with no traffic, the taxi ride from the airport into Dubai is only about £10 more and 15 minutes longer than from Dubai International Airport.